The Langlais Art Trail - laura dunn ART Work Live with ART~! 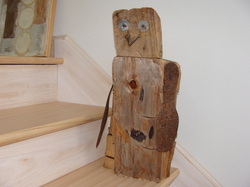 ﻿I am proud to be a small part of The Langlais Art Trail showing two of my sculptures: Self Portrait of Myself as an Alligator, and Brother Owl, both created in homage to the iconic Maine sculptor Bernard Langlais now on view at the Children's Room at McArthur Public Library on Main Street in Biddeford. Stop in to see these two friendly beasts in the good company of 7 Langlais creatures!! this is my love and I am living in it~!